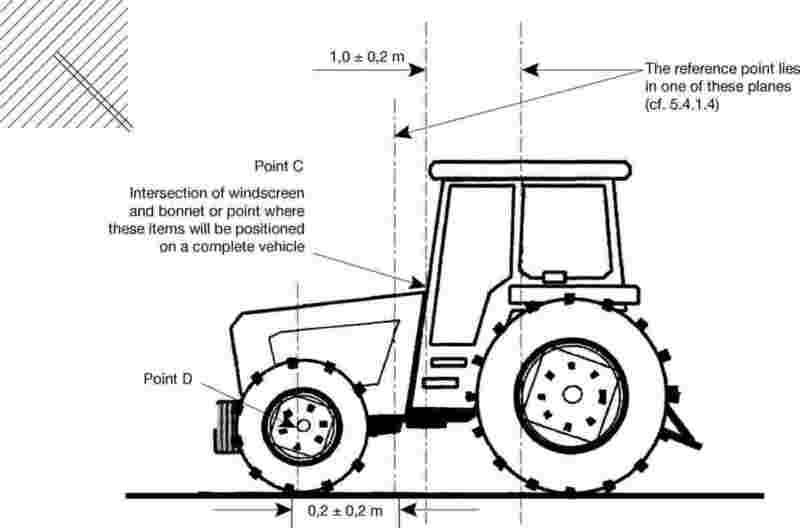 Council Directive 75/322/EEC of 20 May 1975 on the suppression of radio interference produced by agricultural or forestry tractors (electromagnetic compatibility) (3) has been substantially amended several times (4). In the interests of clarity and rationality the said Directive should be codified. Directive 75/322/EEC is one of the separate Directives of the EC type-approval system provided for in Council Directive 74/150/EEC of 4 March 1974 on the approximation of the laws of the Member States relating to the type-approval of wheeled agricultural or forestry tractors, as replaced by Directive 2003/37/EC of the European Parliament and of the Council of 26 May 2003 on type-approval of agricultural or forestry tractors, their trailers and interchangeable towed machinery, together with their systems, components and separate technical units (5), and lays down technical prescriptions concerning the suppression of radio interference produced by agricultural or forestry tractors (electromagnetic compatibility). 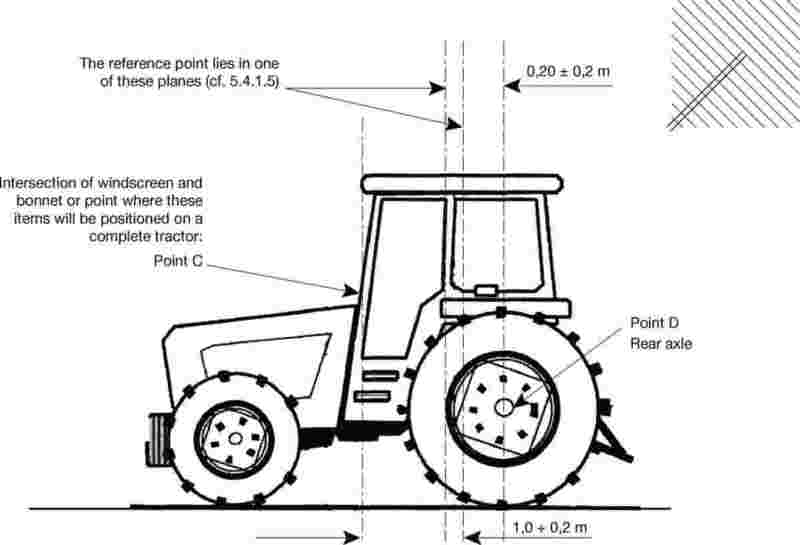 Those technical prescriptions concern the approximation of the laws of the Member States to enable the EC type-approval procedure provided for in Directive 2003/37/EC to be applied in respect of each type of tractor. Consequently, the provisions laid down in Directive 2003/37/EC relating to agricultural and forestry tractors, their trailers and interchangeable towed machinery, together with their systems, components and separate technical units apply to this Directive. For the purposes of this Directive, ‘vehicle’ means any vehicle as defined in Article 2(d) of Directive 2003/37/EC. if the vehicles, components or separate technical units comply with the requirements of this Directive. for any type of vehicle, component or separate technical unit, if the requirements of this Directive are not fulfilled. 3. Paragraph 2 shall not apply to vehicle types approved before 1 October 2002 pursuant to Council Directive 77/537/EEC of 28 June 1977 on the approximation of the laws of the Member States relating to the measures to be taken against the emission of pollutants from diesel engines for use in wheeled agricultural or forestry tractors (6) or to any subsequent extensions to those approvals. if the requirements of this Directive are not fulfilled. 5. Without prejudice to paragraphs 2 and 4, in the case of replacement parts, Member States shall continue to grant EC type-approval and to permit the sale and entry into service of components or separate technical units intended for use on vehicle types which have been approved before 1 October 2002 pursuant to Directive 75/322/EEC or Directive 77/537/EEC and, where applicable, subsequent extensions to those approvals. This Directive shall constitute ‘another Community directive’ for the purposes of Article 1(4) of Directive 2004/108/EC of the European Parliament and of the Council of 15 December 2004 on the approximation of the laws of the Member States relating to electromagnetic compatibility (7). The amendments necessary to adapt to technical progress the requirements of Annexes I to XI shall be adopted in accordance with the procedure referred to in Article 20(3) of Directive 2003/37/EC. Directive 75/322/EEC, as amended by the acts listed in Annex XII, Part A, is repealed, without prejudice to the obligations of the Member States relating to the time-limits for transposition into national law and application of the Directives set out in Annex XII, Part B.
References to the repealed Directive shall be construed as references to this Directive and shall be read in accordance with the correlation table in Annex XIII. (1) OJ C 44, 16.2.2008, p. 34. (3) OJ L 147, 9.6.1975, p. 28. (4) See Annex XII, Part A. (6) OJ L 220, 29.8.1977, p. 38. (7) OJ L 390, 31.12.2004, p. 24. 1.1. This Directive applies to the electromagnetic compatibility of vehicles covered by Article 1. It also applies to electrical or electronic separate technical units intended to be fitted to the vehicles. 2.1.1. ‘Electromagnetic compatibility’ means the ability of a vehicle or component(s) or separate technical unit(s) to function satisfactorily in its electromagnetic environment without introducing intolerable electromagnetic disturbances to anything in that environment. 2.1.2. ‘Electromagnetic disturbance’ means any electromagnetic phenomenon which may degrade the performance of a vehicle or component(s) or separate technical unit(s). An electromagnetic disturbance may be electromagnetic noise, an unwanted signal or a change in the propagation medium itself. 2.1.3. ‘Electromagnetic immunity’ means the ability of a vehicle or component(s) or separate technical unit(s) to perform without degradation of performance in the presence of specified electromagnetic disturbances. 2.1.4. ‘Electromagnetic environment’ means the totality of electromagnetic phenomena existing at a given location. 2.1.5. ‘Reference limit’ means the nominal level to which type-approval and conformity of production limit values are referenced. 2.1.6. 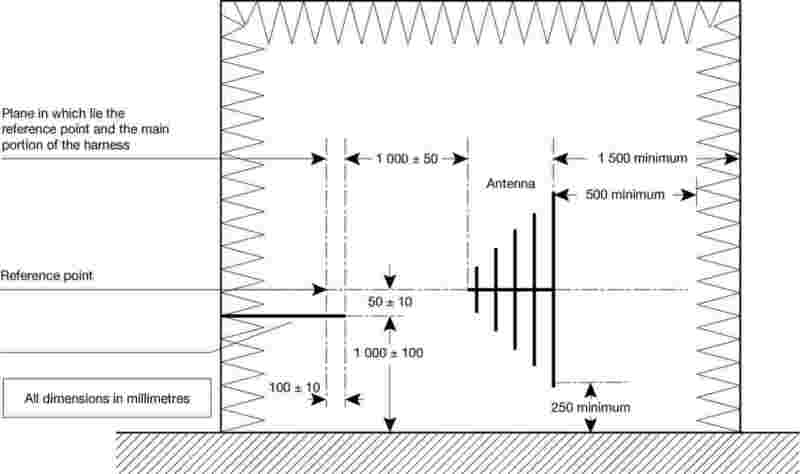 ‘Reference antenna’ for the frequency range 20 to 80 MHz: means a shortened balanced dipole being a half wave resonant dipole at 80 MHz, and for the frequency range above 80 MHz: means a balanced half wave resonant dipole tuned to the measurement frequency. 2.1.7. ‘Broadband emission’ means an emission which has a bandwidth greater than that of a particular measuring apparatus or receiver. 2.1.8. ‘Narrowband emission’ means an emission which has a bandwidth less than that of a particular measuring apparatus or receiver. 2.1.9. ‘Electrical/electronic system’ means (an) electrical and/or electronic device(s) or set(s) of devices together with any associated electrical connections which form part of a vehicle but which are not intended to be type approved separately from the vehicle. 2.1.10. ‘Electrical/electronic sub-assembly’ (ESA) means an electrical and/or electronic device or set(s) of devices intended to be part of a vehicle, together with any associated electrical connections and wiring, which performs one or more specialised functions. An ESA may be approved at the request of a manufacturer as either a ‘component’ or a ‘separate technical unit (STU)’ (see Article 4(1)(c) of Directive 2003/37/EC). 2.1.11.3. the primary material of which the body or shell (if applicable) of the vehicle is constructed (for example, a steel, aluminium or fibreglass body shell); the presence of panels of different material does not change the vehicle type provided the primary material of the body is unchanged; however, such variations must be notified. 2.1.12.2. the general arrangement of the electrical and/or electronic components, if applicable. 3.1.1. The application for approval of a vehicle type, with regard to its electromagnetic compatibility pursuant to Article 4(1) of Directive 2003/37/EC shall be submitted by the vehicle manufacturer. 3.1.2. A model for the information document is set out in Annex II. 3.1.3. The vehicle manufacturer shall draw up a schedule describing all projected combinations of relevant vehicle electrical/electronic systems or ESAs, body styles (1), variations in body material (1), general wiring arrangements, engine variations, left-hand/right-hand drive versions and wheelbase versions. Relevant vehicle electrical/electronic systems or ESAs are those which may emit significant broadband or narrowband radiation and/or those which are involved in the driver's direct control (see point 6.4.2.3) of the vehicle. 3.1.4. A representative vehicle shall be selected from this schedule for the purpose of being tested, in mutual agreement between the manufacturer and the competent authority. This vehicle shall represent the vehicle type (see Appendix 1 of Annex II). The choice of vehicle shall be based on the electrical/electronic systems offered by the manufacturer. One more vehicle may be selected from this schedule for the purpose of being tested if it is considered by mutual agreement between the manufacturer and the competent authority that different electrical/electronic systems are included which are likely to have a significant effect on the vehicle's electromagnetic compatibility compared with the first representative vehicle. 3.1.5. The choice of the vehicle(s) in conformity with point 3.1.4 is limited to vehicle/electrical/electronic system combinations intended for actual production. 3.1.6. The manufacturer may supplement the application with a report from tests which have been carried out. Any such data provided may be used by the approval authority for the purpose of drawing up the EC type-approval certificate. 3.1.7. If the technical service responsible for the type-approval test carries out the test itself, then a vehicle representative of the type to be approved, according to point 3.1.4 shall be provided. 3.2.1. The application for approval of a type of ESA with regard to its electromagnetic compatibility pursuant to Article 4(1) of Directive 2003/37/EC shall be submitted by the vehicle manufacturer or by the manufacturer of the ESA. 3.2.2. A model for the information document is set out in Annex III. 3.2.3. The manufacturer may supplement the application with a report from tests which have been carried out. Any such data provided may be used by the approval authority for the purpose of drawing up the EC type-approval certificate. 3.2.4. If the technical service responsible for the type-approval test carries out the test itself, then a sample of the ESA system representative of the type to be approved shall be provided, if necessary, after discussion with the manufacturer on, for example, possible variations in the layout, the number of components and the number of sensors. If the technical service deems it necessary, it may select a further sample. 3.2.5. The sample(s) must be clearly and indelibly marked with the manufacturer's trade name or mark and the type designation. 3.2.6. Where applicable, any restrictions on use shall be identified. Any such restrictions shall be included in the information document set out in Annex III and/or in the EC type-approval certificate set out in Annex V.
The following alternative routes to type-approval of a vehicle may be used at the discretion of the vehicle manufacturer. A vehicle installation may achieve type-approval directly by following the provisions laid down in point 6. If this route is chosen by a vehicle manufacturer, no separate testing of electrical/electronic systems or ESAs is required. A vehicle manufacturer may obtain approval for the vehicle by demonstrating to the approval authority that all the relevant (see point 3.1.3) electrical/electronic systems or ESAs have individually been approved in accordance with this Directive and have been installed in accordance with any conditions attached thereto. 4.1.1.3. A manufacturer, if he wishes, may obtain approval pursuant to this Directive if the vehicle has no equipment of the type which is subject to immunity or emission tests. The vehicle shall have no systems as specified in point 3.1.3 (immunity) and no spark ignition equipment. Such approvals shall not require testing. Type-approval may be granted to an ESA to be fitted either to any vehicle type or to a specific vehicle type or types requested by the manufacturer. ESAs involved in the direct control of vehicles will normally receive type-approval in conjunction with a vehicle manufacturer. 4.2.1.1. If the representative vehicle fulfils the requirements of this Directive, EC type-approval pursuant to Article 4 of Directive 2003/37/EC shall be granted. 4.2.1.2. A model for the EC type-approval certificate is set out in Annex IV. 4.2.2.1. If the representative ESA system(s) fulfil(s) the requirements of this Directive, EC type-approval pursuant to Article 4 of Directive 2003/37/EC shall be granted. 4.2.2.2. A model for the EC type-approval certificate is given in Annex V.
4.2.3. In order to draw up the certificates referred to in point 4.2.1.2 or 4.2.2.2, the competent authority of the Member State granting the approval may use a report prepared by an approved or recognised laboratory or in accordance with the provisions of this Directive. 4.3.1. In the case of amendments to approvals granted pursuant to this Directive, the provisions of Article 5(2) and (3) of Directive 2003/37/EC shall apply. 4.3.2.1. Where a vehicle manufacturer has obtained approval for a vehicle installation and wishes to fit an additional or substitutional electrical/electronic system or ESA which has already received approval pursuant to this Directive, and which will be installed in accordance with any conditions attached thereto, the vehicle approval may be amended without further testing. The additional or substitutional electrical/electronic system or ESA shall be considered as part of the vehicle for conformity of production purposes. 4.3.2.2. Where the additional or substitutional part(s) has (have) not received approval pursuant to this Directive, and if testing is considered necessary, the whole vehicle shall be deemed to comply if the new or revised part(s) can be shown to comply with the relevant requirements of point 6 or if, in a comparative test, the new part can be shown not to be likely to adversely affect compliance of the vehicle type. 4.3.2.3. The addition by a vehicle manufacturer to an approved vehicle of standard domestic or business equipment, other than mobile communication equipment (2) which complies with Directive 2004/108/EC, and is installed according to the recommendations of the equipment and vehicle manufacturers, or the substitution or removal thereof, shall not invalidate the vehicle approval. This shall not preclude vehicle manufacturers fitting communication equipment with suitable installations guidelines developed by the vehicle manufacturer and/or manufacturer(s) of such communication equipment. The vehicle manufacturer shall provide evidence (if requested by the test authority) that vehicle performance is not adversely affected by such transmitters. This may be a statement that the power levels and installation are such that the immunity levels of this Directive offer sufficient protection when subject to transmission alone, namely excluding transmission in conjunction with the tests specified in point 6. This Directive does not authorise the use of a communication transmitter when other requirements on such equipment or its use apply. A vehicle manufacturer may refuse to install in his vehicle standard domestic or business equipment which complies with Directive 2004/108/EC. 5.1. Every ESA conforming to a type approved pursuant to this Directive shall bear an EC type-approval mark. 1 for Germany; 2 for France; 3 for Italy; 4 for the Netherlands; 5 for Sweden; 6 for Belgium; 7 for Hungary; 8 for the Czech Republic; 9 for Spain; 11 for the United Kingdom; 12 for Austria; 13 for Luxembourg; 17 for Finland; 18 for Denmark; 19 for Romania; 20 for Poland; 21 for Portugal; 23 for Greece; 24 for Ireland; 26 for Slovenia; 27 for Slovakia; 29 for Estonia; 32 for Latvia; 34 for Bulgaria; 36 for Lithuania; 49 for Cyprus; 50 for Malta. 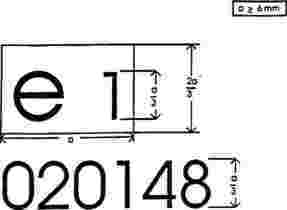 It must also include in the vicinity of the rectangle the four-digit sequential number (with leading zeros as applicable) — hereinafter referred to as the ‘base approval number’ — contained in Section 4 of the type-approval number shown on the EC type-approval certificate issued for the type of device in question (see Annex V), preceded by the two figures indicating the sequence number assigned to the most recent major technical amendment to Directive 75/322/EEC, as replaced by this Directive, on the date EC component type-approval was granted. 5.3. The EC type-approval mark must be affixed to the main part of the ESA (for example the electronic control unit) in such a way as to be clearly legible and indelible. 5.4. An example of the EC type-approval mark is set out in Appendix 7. 5.5. No marking is required for electrical/electronic systems included in vehicle types approved by this Directive. 5.6. Markings on ESAs in compliance with point 5.3 need not be visible when the ESA is installed in a vehicle. 6.1.1. A vehicle (and its electrical/electronic system(s) or ESAs) shall be so designed, constructed and fitted as to enable the vehicle, in normal conditions of use, to comply with the requirements of this Directive. The electromagnetic radiation generated by the vehicle representative of its type shall be measured using the method described in Annex VI at either of the defined antenna distances. The choice shall be made by the vehicle manufacturer. 6.2.2.1. If measurements are made using the method described in Annex VI using a vehicle-to-antenna spacing of 10,0 ± 0,2 m, the radiation reference limits shall be 34 dB microvolts/m (50 microvolts/m) in the 30 to 75 MHz frequency band and 34 to 45 dB microvolts/m (50 to 180 microvolts/m) in the 75 to 400 MHz frequency band, this limit increasing logarithmically (linearly) with frequencies above 75 MHz as shown in Appendix 1 of this Annex. In the 400 to 1 000 MHz frequency band the limit remains constant at 45 dB microvolts/m (180 microvolts/m). 6.2.2.2. If measurements are made using the method described in Annex VI using a vehicle-to-antenna spacing of 3,0 ± 0,05 m, the radiation reference limits shall be 44 dB microvolts/m (160 microvolts/m) in the 30 to 75 MHz frequency band and 44 to 55 dB microvolts/m (160 to 562 microvolts/m) in the 75 to 400 MHz frequency band, this limit increasing logarithmically (linearly) with frequencies above 75 MHz as shown in Appendix 2 of this Annex. In the 400 to 1 000 MHz frequency band the limit remains constant at 55 dB microvolts/m (562 microvolts/m). 6.2.2.3. On the vehicle representative of its type, the measured values, expressed in dB microvolts/m (microvolts/m), shall be at least 2,0 dB (20 %) below the reference limits. The electromagnetic radiation generated by the vehicle representative of its type shall be measured using the method described in Annex VII at either of the defined antenna distances. The choice shall be made by the vehicle manufacturer. 6.3.2.1. If measurements are made using the method described in Annex VII using a vehicle-to-antenna spacing of 10,0 ± 0,2 m, the radiation-reference limits shall be 24 dB microvolts/m (16 microvolts/m) in the 30 to 75 MHz frequency band and 24 to 35 dB microvolts/m (16 to 56 microvolts/m) in the 75 to 400 MHz frequency band, this limit increasing logarithmically (linearly) with frequencies above 75 MHz as shown in Appendix 3 of this Annex. In the 400 to 1 000 MHz frequency band the limit remains constant at 35 dB microvolts/m (56 microvolts/m). 6.3.2.2. If measurements are made using the method described in Annex VII using a vehicle-to-antenna spacing of 3,0 ± 0,05 m, the radiation reference limit shall be 34 dB microvolts/m (50 microvolts/m) in the 30 to 75 MHz frequency band and 34 to 45 dB microvolts/m (50 to 180 microvolts/m) in the 75 to 400 MHz frequency band, this limit increasing logarithmically (linearly) with frequencies above 75 MHz as shown in Appendix 4 of this Annex. In the 400 to 1 000 MHz frequency band the limit remains constant at 45 dB microvolts/m (180 microvolts/m). 6.3.2.3. On the vehicle representative of its type, the measured values, expressed in dB microvolts/m (microvolts/m), shall be at least 2,0 dB (20 %) below the reference limit. 6.3.2.4. 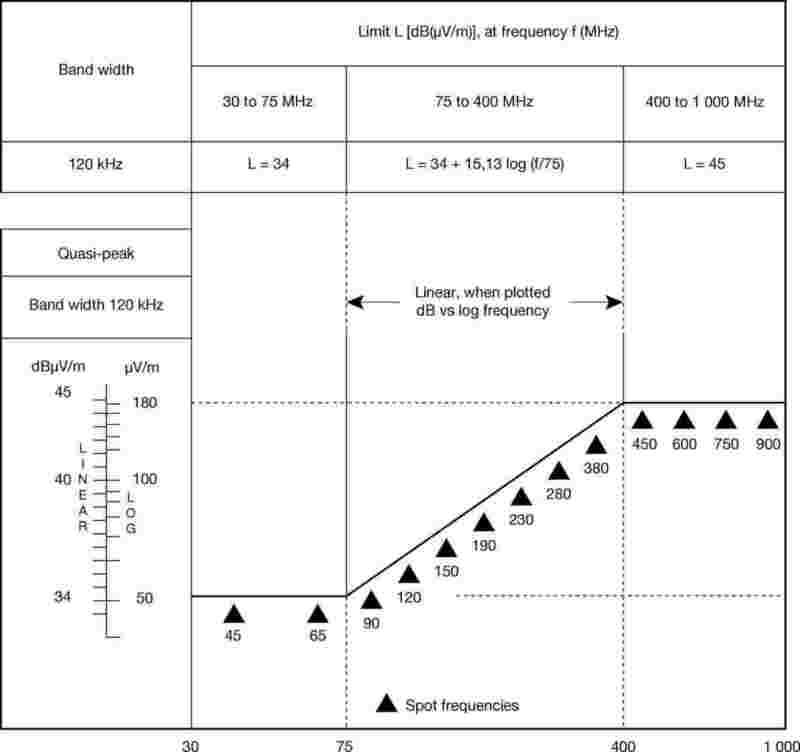 Notwithstanding the limits defined in points 6.3.2.1, 6.3.2.2 and 6.3.2.3 of this Annex, if, during the initial step described in point 1.3 of Annex VII, the signal strength measured at the vehicle broadcast radio antenna is less than 20 dB microvolts/m (10 microvolts/m) over the frequency range 88 to 108 MHz, then the vehicle shall be deemed to comply with the limits for narrowband emissions and no further testing will be required. The immunity to electromagnetic radiation of the vehicle representative of its type shall be tested by the method described in Annex VIII. 6.4.2.1. If tests are made using the method described in Annex VIII, the field strength reference level shall be 24 volts/m rms in over 90 % of the 20 to 1 000 MHz frequency band and 20 volts/m rms over the whole 20 to 1 000 MHz frequency band. 6.4.2.2. The vehicle representative of its type shall be considered as complying with immunity requirements if, during the tests performed in accordance with Annex VIII, and subjected to a field strength, expressed in volts/m, of 25 % above the reference level, there shall be no abnormal change in the speed of the driven wheels of the vehicle, no degradation of performance which would cause confusion to other road users, and no degradation in the driver's direct control of the vehicle which could be observed by the driver or other road user. 6.4.2.3. The driver's direct control of the vehicle is exercised by means of, for example, steering, braking, or engine speed control. The electromagnetic radiation generated by the ESA representative of its type shall be measured by the method described in Annex IX. 6.5.2.1. If measurements are made using the method described in Annex IX, the radiation reference limits shall be 64 to 54 dB microvolts/m(1 600 to 500 microvolts/m) in the 30 to 75 MHz frequency band, this limit decreasing logarithmically (linearly) with frequencies above 30 MHz, and 54 to 65 dB microvolts/m (500 to 1 800 microvolts/m) in the 75 to 400 MHz band, this limit increasing logarithmically (linearly) with frequencies above 75 MHz as shown in Appendix 5 of this Annex. In the 400 to 1 000 MHz frequency band the limit remains constant at 65 dB microvolts/m (1 800 microvolts/m). 6.5.2.2. On the ESA representative of its type, the measured values, expressed in dB microvolts/m, (microvolts/m) shall be at least 2,0 dB (20 %) below the reference limits. The electromagnetic radiation generated by the ESA representative of its type shall be measured by the method described in Annex X. 6.6.2.1. If measures are made using the method described in Annex X, the radiation reference limits shall be 54 to 44 dB microvolts/m (500 to 160 microvolts/m) in the 30 to 75 MHz frequency band, this limit decreasing logarithmically (linearly) with frequencies above 30 MHz, and 44 to 55 dB microvolts/m (160 to 560 microvolts/m) in the 75 to 400 MHz band, this limit increasing logarithmically (linearly) with frequencies above 75 MHz as shown in Appendix 6 of this Annex. In the 400 to 1 000 MHz frequency band the limit remains constant at 55 dB microvolts/m (560 microvolts/m). 6.6.2.2. On the ESA representative of its type, the measured value, expressed in dB microvolts/m (microvolts/m) shall be at least 2,0 dB (20 %) below the reference limits. The immunity to electromagnetic radiation of the ESA representative of its type shall be tested by the method(s) chosen from those described in Annex XI. 6.7.2.1. If tests are made using the methods described in Annex XI, the immunity test reference levels shall be 48 volts/m for the 150 mm stripline testing method, 12 volts/m for the 800 mm stripline testing method, 60 volts/m for the transverse electromagnetic mode (TEM) cell testing method, 48 mA for the bulk current injection (BCI) testing method and 24 volts/m for the free field testing method. 6.7.2.2. On the ESA representative of its type at a field strength or current expressed in appropriate linear units 25 % above the reference limit, the ESA shall not exhibit any malfunction which would cause any degradation of performance which could cause confusion to other road users or any degradation in the driver's direct control of a vehicle fitted with the system which could be observed by the driver or other road user. 7.1. Conformity of production with regard to the electromagnetic compatibility of the vehicle or component of separate technical unit shall be checked on the basis of the data contained in the EC type-approval certificate(s) set out in Annex IV and/or Annex V as appropriate. 7.2. If the conformity of a vehicle, component or STU taken from the series is being verified, production shall be deemed to conform to the requirements of this Directive in relation to broadband radiated emissions and narrowband radiated emissions if the levels measured do not exceed by more than 2 dB, (25 %) the reference limits prescribed in points 6.2.2.1, 6.2.2.2, 6.3.2.1 and 6.3.2.2 (as appropriate). 7.3. If the conformity of a vehicle, component or STU taken from the series is being verified, production shall be deemed to conform to the requirements of this Directive in relation to immunity to electromagnetic radiation if the vehicle, component or STU does not exhibit any degradation relating to the direct control of the vehicle which could be observed by the driver or other road user when the vehicle, component or STU is in the state defined in point 4 of Annex VIII and subjected to a field strength, expressed in volts/m, up to 80 % of the reference limits prescribed in point 6.4.2.1 of this Annex. 8.1. Where a vehicle or electrical/electronic system or ESA does not include an electronic oscillator with an operating frequency greater than 9 kHz, it shall be deemed to comply with point 6.3.2 or 6.6.2 of this Annex and with Annexes VII and X. 8.2. Vehicles which do not have electrical/electronic systems or ESAs involved in the direct control of the vehicle need not be tested for immunity and shall be deemed to comply with point 6.4 of this Annex and with Annex VIII. 8.3. ESAs whose functions are not involved in the direct control of the vehicle need not be tested for immunity and shall be deemed to comply with point 6.7 of this Annex and with Annex XI. For vehicles fitted with tyres, the vehicle body/chassis can be considered to be an electrically isolated structure. Significant electrostatic forces in relation to the vehicle's external environment only occur at the moment of occupant entry into or exit from the vehicle. As the vehicle is stationary at these moments, no type-approval test for electrostatic discharge is deemed necessary. Since during normal driving, no external electrical connections are made to vehicles, no conducted transients are generated in relation to the external environment. The responsibility of ensuring that equipment can tolerate the conducted transients within a vehicle, for example due to load switching and interaction between systems, lies with the manufacturer. No type-approval test for conducted transients is deemed necessary. (2) For example: radio telephone and citizens' band radio. The ESA bearing the above EC type-approval mark is a device which has been approved in Germany (e1) under the base approval number 0148. The first two digits (02) indicate that the device conforms with the requirements of Directive 75/322/EEC, as amended by Directive 2000/2/EC. The following information, if applicable, must be supplied in triplicate and include a list of contents. Any drawings must be supplied in appropriate scale and in sufficient detail on size A4 or on a folder of A4 format. Photographs, if any, must show sufficient detail. Details must be provided of the working of any systems, comportents or technical units with electronic controls. Relevant test report(s) supplied by the manufacturer or approved/recognised laboratories for the purpose of drawing up the EC type-approval certificate. The following information, if applicable, must be supplied in triplicate and must include a list of contents. Any drawings must be supplied in appropriate scale and in sufficient detail on size A4 or on a folder of A4 format. Photographs, if any, must show sufficient detail. If the systems, component or separate technical units (stu) have electronic controls, information concerning their performance must be supplied. of a type of vehicle with regard to Directive 2009/64/EC. (2) If the means of identification of type contains characters not relevant to describe the vehicle, component or separate technical unit types covered by this type-approval certificate such characters shall be represented in the documentation by the symbol: ‘?’ (for example ABC??123??). of a type of component/separate technical unit (1) with regard to Directive 2009/64/EC. 9. The index to the information package lodged with the approval authority, which may be obtained on request is attached. 1.5. Approved/recognised laboratory (for the purpose of this Directive) responsible for carrying out the test. 1.1. The test method described in this Annex shall only be applied to vehicles. The measuring equipment shall comply with the requirements of publication No 16-1 (93) of the International Special Committee on Radio Interference (CISPR). A quasi-peak detector shall be used for the measurement of broadband electromagnetic emissions in this Annex, or if a peak detector is used an appropriate correction factor shall be used depending on the spark pulse rate. This test is intended to measure the broadband electromagnetic emissions generated by spark-ignition systems and by electric motors (electric traction motors, engines for heating or de-icing systems, fuel pumps, water pumps, etc.) permanently fitted to the vehicle. Two alternative reference antenna distances are permissible: 10 or 3 m from the vehicle. In either case the requirements of point 3 shall be complied with. The results of measurements shall be expressed in dB microvolts/m (microvol/m) for 120 kHz band width. If the actual band width B (expressed in kHz) of the measuring apparatus differs from 120 kHz, the readings taken in microvolts/m shall be converted to 120 kHz band width through multiplication by a factor 120/B. 3.1. 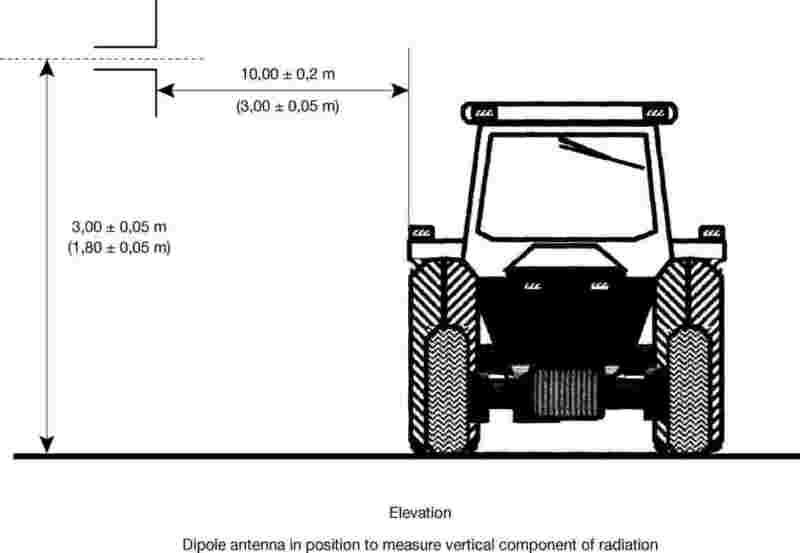 The test site shall be a level, clear area free from electromagnetic reflecting surfaces within a circle of minimum radius 30 m measured from a point midway between the vehicle and the antenna (see Figure 1 in Appendix 1). 3.2. 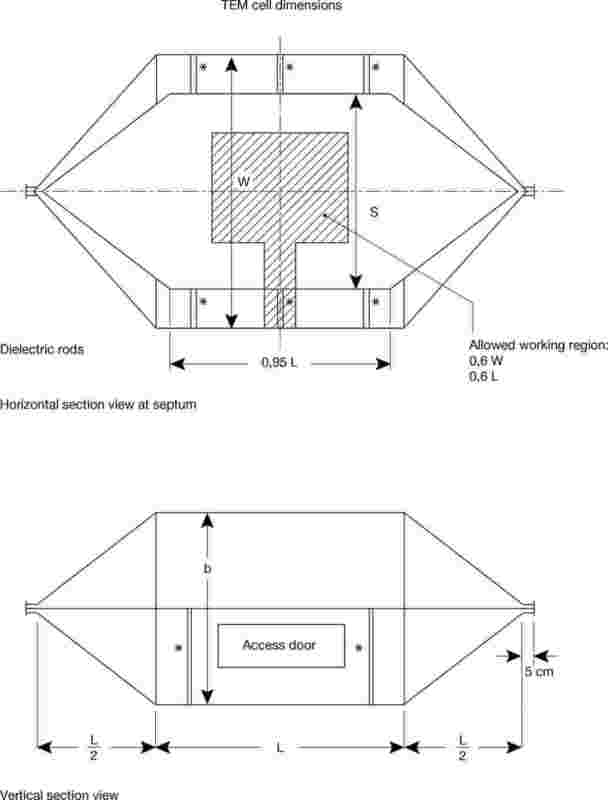 The measuring set, test hut, or vehicle in which the measurement set is located may be within the test site, but only in the permitted region shown in Figure 1 in Appendix 1. Other measuring antennae are allowed within the test area, at a minimum distance of 10 m both from receiving antenna and the vehicle under test, provided that it can be shown that the test results will not be affected. 3.3. Enclosed test facilities may be used if correlation can be shown between the enclosed test facility and an outdoor site. Enclosed test facilities do not need to meet the dimensional requirements of Figure 1 in Appendix 1 other than the distance from the antenna to the vehicle and the height of the antenna. Neither do they need to have ambient emissions checked before or after the test as indicated in point 3.4. To ensure that there is no extraneous noise or signal of a magnitude sufficient to affect materially the measurement, measurements shall be taken before and after the main test. If the vehicle is present when ambient measurements are taken, it will be necessary to ensure that any emissions from the vehicle do not affect significantly the ambient measurements, for example by removing the vehicle from the test area, removing the ignition key, or disconnecting the battery. In both of the measurements, the extraneous noise or signal shall be at least 10 dB below the limits of interference given in point 6.2.2.1 or 6.2.2.2 (as appropriate) of Annex I, except for intentional narrowband ambient transmissions. The engine shall be running at its normal operating temperature and the transmission shall be in neutral. If for practical reasons this cannot be achieved, alternative arrangements mutually agreed between the manufacturer and the test authorities may be made. 4.2. Testing shall not be conducted while rain or other precipitation is falling on the vehicle or within 10 minutes after such precipitation has stopped. Any antenna may be used provided it can be normalised to the reference antenna. The method described in CISPR publication No 12, Edition 3, Appendix A, may be used to calibrate the antenna. The phase centre of the antenna shall be 3,00 ± 0,05 m above the plane on which the vehicle rests. The phase centre of the antenna shall be 1,80 ± 0,05 m above the plane on which the vehicle rests. 5.2.1.3. No part of any antenna's receiving elements shall be closer than 0,25 m to the plane on which the vehicle rests. The horizontal distance from the tip or other appropriate point of the antenna defined during the normalisation procedure described in point 5.1 to the outer body surface of the vehicle shall be 10,0 ± 0,2 m.
The horizontal distance from the tip or other appropriate point of the antenna defined during the normalisation procedure described in point 5.1 to the outer body surface of the vehicle shall be 3,00 ± 0,05 m.
5.2.2.3. 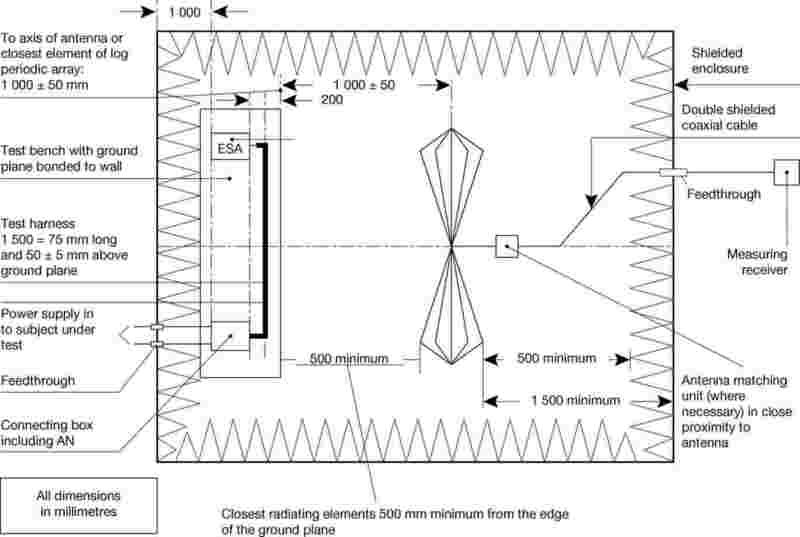 If the test is carried out in a facility enclosed for radio frequency electromagnetic screening purposes, the antenna's receiving elements shall be no closer than 1,0 m to any radio absorbent material and no closer than 1,5 m to the wall of the enclosed facility. There must be no absorbent material between the receiving antenna and vehicle under test. 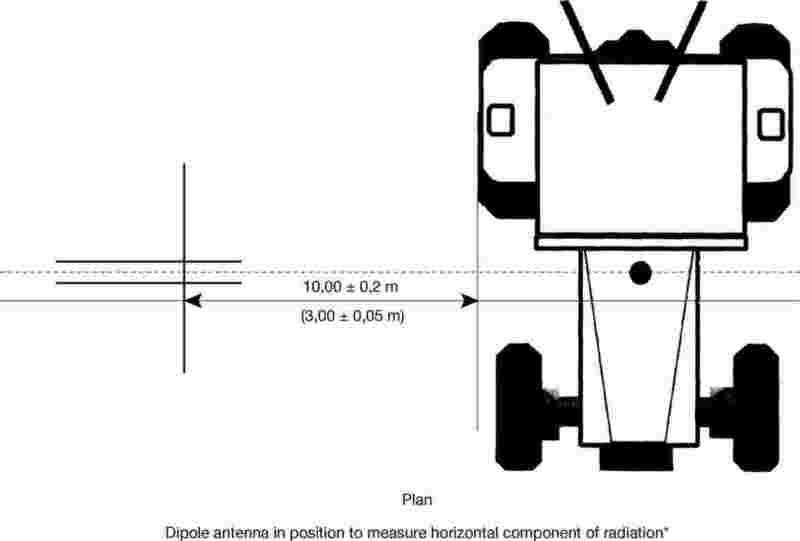 The antenna shall be located successively on the left and right-hand sides of the vehicle, with the antenna parallel to the plane of longitudinal symmetry of the vehicle, in line with the engine mid-point (see Figure 1 in Appendix 1) and in line with the vehicle mid-point defined as the point on the principal axis of the vehicle midway between the centres of the front and rear axles of the vehicle. At each of the measuring points, readings shall be taken both with the antenna in a horizontal and in a vertical polarisation (see Figure 2 in Appendix 1). The maximum of the four readings taken in accordance with points 5.3 and 5.4 at each spot frequency shall be taken as the characteristic reading at the frequency at which the measurements were made. Las mediciones se efectuarán en la gama de frecuencias que va desde los 30 hasta los 1 000 MHz. A fin de comprobar que se cumplen los requisitos del presente anexo, la autoridad encargada del ensayo efectuará ensayos en hasta 13 frecuencias de dicha gama, por ejemplo 45, 65, 90, 120, 150, 190, 230, 280, 380, 450, 600, 750 y 900 MHz. En caso de que se rebase el límite durante el ensayo, se deberá comprobar si ello se debe al vehículo y no a la radiación ambiental. 6.1.1. The limits apply throughout the frequency range 30 to 1 000 MHz. 6.1.2. Measurements can be performed with either quasi-peak or peak detectors. The limits given in points 6.2 and 6.5 of Annex I are for quasi-peak. If peak is used, add 38 dB for 1 MHz band width or subtract 22 dB for 1 kHz band width. The tolerances apply to frequencies quoted and are intended to avoid interference from transmissions operating on or near the nominal spot frequencies during the time of measurement. An average detector or a peak detector shall be used for the measurement of radiated narrowband electromagnetic emissions in this Annex. 1.3.1. This test is intended to measure narrowband electromagnetic emissions such as might emanate from a microprocessor-based system or other narrowband source. 1.3.2. As an initial step the levels of emissions in the FM frequency band (88 to 108 MHz) shall be measured at the vehicle broadcast radio antenna with equipment as specified in point 1.2. If the level specified in point 6.3.2.4 of Annex I is not exceeded, then the vehicle shall be deemed to comply with the requirements of this Annex in respect of that frequency band and the full test shall not be carried out. 1.3.3. In the full test procedure two alternative antenna distances are permissible: 10 or 3 m from the vehicle. In either case the requirements of point 3 of this Annex shall be complied with. The results of measurements shall be expressed in dB microvolts/m (microvolts/m). 3.1. 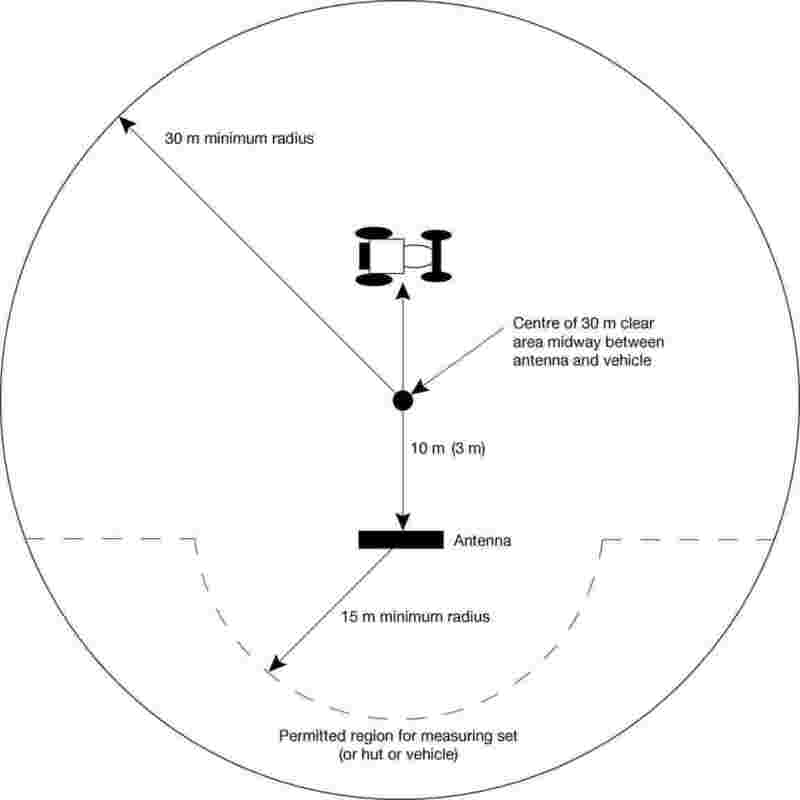 The test site shall be a level, clear area free from electromagnetic reflecting surfaces within a circle of minimum radius 30 m measured from a point midway between the vehicle and the antenna (see Figure 1 in Appendix 1 of Annex VI). 3.2. 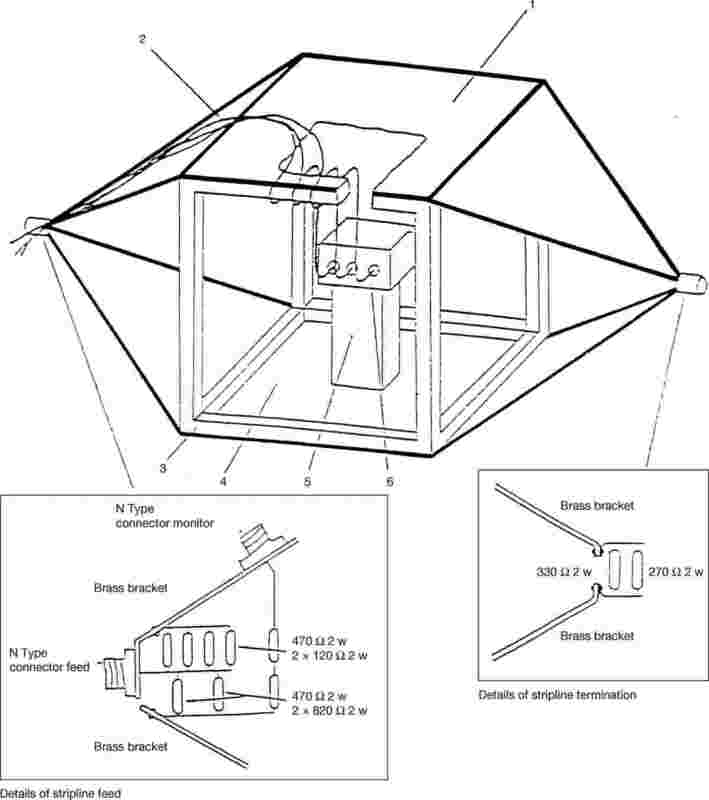 The measuring set, test hut, or vehicle in which the measurement set is located may be within the test site, but only in the permitted region shown in Figure 1 in Appendix 1 of Annex VI. 3.3. Enclosed test facilities may be used if correlation can be shown between the enclosed test facility and an outdoor site. Enclosed test facilities do not need to meet the dimensional requirements of Figure 1 in Appendix 1 of Annex VI other than the distance from the antenna to the vehicle and the height of the antenna. Neither do they need to have ambient emissions checked before or after the test as indicated in point 3.4 of this Annex. To ensure that there is no extraneous noise or signal of a magnitude sufficient to affect materially the measurement, ambient measurements shall be taken before and after the main test. It will be necessary to ensure that any emissions from the vehicle do not affect significantly the ambient measurements, for example by removing the vehicle from the test area, removing the ignition key, or disconnecting the battery(ies). In both of the measurements, the extraneous noise or signal shall be at least 10 dB below the limits of interference given in point 6.3.2.1 or 6.3.2.2 (as appropriate) of Annex I, except for intentional narrowband ambient transmissions. 4.1. The vehicle's electronic systems shall all be in normal operating mode with the vehicle stationary. 4.2. The ignition shall be switched on. The engine shall not be operating. 4.3. Measurements shall not be made while rain or other precipitation is falling on the vehicle or within 10 minutes after such precipitation has stopped. Any antenna may be used provided that it can be normalised to the reference antenna. The method described in the CISPR publication No 12, Edition 3, Appendix A, may be used to calibrate the antenna. The antenna shall be located successively on the left and right-hand sides of the vehicle with the antenna parallel to the plane of longitudinal symmetry of the vehicle and in line with the engine mid-point (see Figure 2 in Appendix 1 of Annex VI). At each of the measuring points, readings shall be taken both with the antenna in a horizontal and in a vertical polarisation (see Figure 2 in Appendix 1 of Annex VI). The maximum of the four readings taken in accordance with points 5.3 and 5.4 at each spot frequency shall be taken as the characteristic reading at the frequency at which the measurements are made. 30 to 50, 50 to 75, 75 to 100, 100 to 130, 130 to 165, 165 to 200, 200 to 250, 250 to 320, 320 to 400, 400 to 520, 520 to 660, 660 to 820, 820 to 1 000 MHz. In the event that the limit is exceeded during the test, investigations shall be made to ensure that this is due to the vehicle and not to background radiation. This test is intended to demonstrate the immunity to degradation in the direct control of the vehicle. The vehicle shall be subject to electromagnetic fields as described in this Annex. The vehicle shall be monitored during the tests. For the test described in this Annex, field strengths shall be expressed in volts/m. The test facility shall be capable of generating the field strengths over the frequency ranges defined in this Annex. The test facility shall comply with (national) legal requirements regarding the emission of electromagnetic signals. Care shall be taken so that the control and monitoring equipment shall not be affected by radiated fields in such a way as to invalidate the tests. The vehicle shall be in an unladen condition except for necessary test equipment. 4.1.1. The engine shall turn the driving wheels normally at a constant speed corresponding to three quarters of the maximum speed of the vehicle if there is no technical reason for the manufacturer to prefer another speed. The vehicle's engine must be loaded with an appropriate torque. If need be, the transmission shafts may be disengaged (for example, in the case of vehicles with more than two axles), provided they do not drive a component-emitting interference. 4.1.2. Headlamps shall be on dipped beam. 4.1.3. Left or right-direction indicator shall be operating. 4.1.4. All other systems which affect the driver's control of the vehicle shall be (on) as in normal operation of the vehicle. 4.1.5. The vehicle shall not be electrically connected to the test area and no connections shall be made to the vehicle from any equipment, except as required by point 4.1.1 or 4.2. Tyre contact with the test area floor shall not be considered to be an electrical connection. 4.2. If there are vehicle electrical/electronic systems which form an integral part of the direct control of the vehicle, which will not operate under the conditions described in point 4.1, it will be permissible for the manufacturer to provide a report or additional evidence to the testing authority that the vehicle electrical/electronic system meets the requirements of this Directive. Such evidence shall be retained in the type-approval documentation. 4.3. Only non-perturbing equipment shall be used while monitoring the vehicle. The vehicle exterior and the passenger compartment shall be monitored to determine whether the requirements of this Annex are met (for example by using (a) video camera(s)). 4.4. The vehicle shall normally face a fixed antenna. However, where the electronic control units and the associated wiring harness are predominantly in the rear of the vehicle, the test shall normally be carried out with the vehicle facing away from the antenna. In the case of long vehicles (namely excluding cars and light vans), which have electronic control units and associated wiring harness predominantly towards the middle of the vehicle, a reference point (see point 5.4) may be established based on either the right-side surface or the left-side surface of the vehicle. This reference point shall be at the midpoint of the vehicle's length or at one point along the side of the vehicle chosen by the manufacturer in conjunction with the competent authority after considering the distribution of electronic systems and the layout of any wiring harness. Such testing may only take place if the physical construction of the chamber permits. The antenna location must be noted in the test report. 5.1.1. The field generating device type(s) shall be chosen such that the desired field strength is achieved at the reference point (see point 5.4) at the appropriate frequencies. 5.1.2. The field generating device(s) may be an antenna or antennas or a transmission line system (TLS). 5.1.3. The construction and orientation of any field generating device shall be such that the generated field is polarised: from 20 to 1 000 MHz horizontally or vertically. 5.2.1.1. The phase centre of any antenna shall not be less than 1,5 m above the plane on which the vehicle rests or not less than 2,0 m above the plane on which the vehicle rests if the vehicle roof exceeds 3 m in height. 5.2.1.2. No part of any antenna's radiating elements shall be closer than 0,25 m to the plane on which the vehicle rests. 5.2.2.1. In-service conditions may be best approximated by placing the field generating device as far from the vehicle as practical. This distance will typically lie within the range 1 to 5 m.
5.2.2.2. If the test is carried out in an enclosed facility, the field generating device's radiating elements shall be no closer than 1,0 m to any radio absorbent material and no closer than 1,5 m to the wall of the enclosed facility. There shall be no absorbent material between the transmitting antenna and the vehicle under test. 5.3.1. The field generating device's radiating elements shall not be closer than 0,5 m to the outer body surface of the vehicle. 5.3.2. The field generating device shall be positioned on the vehicle's centre line (plane of longitudinal symmetry). 5.3.3. No part of a TLS, with the exception of the plane on which the vehicle rests, shall be closer than 0,5 m to any part of the vehicle. 5.3.4. Any field generating device which is placed over the vehicle shall extend centrally over at least 75 % of the length of the vehicle. whichever results in a reference point closer to the antenna. 5.5. If it is decided to radiate the rear of the vehicle, the reference point shall be established as in point 5.4. The vehicle shall then be installed facing away from the antenna and positioned as if it had been horizontally rotated 180° around its centre point, namely in such a way that the distance from the antenna to the nearest part of the outer body of the vehicle remains the same. This is illustrated in Appendix 3. The vehicle shall be exposed to electromagnetic radiation in the 20 to 1 000 MHz frequency range. 27, 45, 65, 90, 120, 150, 190, 230, 280, 380, 450, 600, 750 and 900 MHz. The response time of the equipment under test shall be considered and the dwell time shall be sufficient to allow the equipment under test to react under normal conditions. In any case, it shall not be less than two seconds. 6.1.2. One mode of polarisation shall be used at each frequency — see point 5.1.3. 6.1.3. All other test parameters shall be as defined in this Annex. 6.1.4. If a vehicle fails the test defined in point 6.1.1, it must be verified as having failed under the relevant test conditions and not as a result of the generation of uncontrolled fields. 7.1.1. The ‘substitution method’ shall be used to establish the test field conditions. At each test frequency, a level of power shall be fed into the field generating device to produce the required field strength at the reference point (as defined in point 5) in the test area with the vehicle absent, the level of forward power, or another parameter directly related to the forward power required to define the field, shall be measured and the results recorded. Test frequencies shall lie in the range 20 to 1 000 MHz. Calibration shall be made, starting at 20, in steps not greater than two per cent of the previous frequency finishing at 1 000 MHz. These results shall be used for type-approval tests unless changes occur in the facilities or equipment which necessitate this procedure being repeated. The vehicle shall then be introduced into the test facility and positioned in accordance with the requirements of point 5. The required forward power defined in point 7.1.2 at each frequency as defined in point 6.1.1 shall then be applied to the field generating device. 7.1.4. Whatever parameter was chosen in point 7.1.2 to define the field, the same parameter shall be used to establish the field strength during the test. 7.1.5. The field generating equipment and its layout employed during the test shall be to the same specification as that used during the operations performed in point 7.1.2. A suitable compact field strength measuring device shall be used to determine the field strength during the calibration phase of the substitution method. 7.1.7. During the calibration phase of the substitution method, the phase centre of the field strength measuring device shall be positioned at the reference point. 7.1.8. If a calibrated receiving antenna is used as the field strength measuring device, readings shall be obtained in three mutually orthogonal directions and the isotropic equivalent value of the readings shall be taken as the field strength. 7.1.9. To take account of different vehicle geometries, a number of antennae positions or reference points may need to be established for a given test facility. in the case of a TLS, 1,50 ± 0,05 m on a line passing through the reference point at the same height as the reference point and along the line of longitudinal symmetry. Notwithstanding the condition set out in point 7.2.1, tests shall not be performed at chamber resonant frequencies. The maximum envelope excursion of the test signal shall equal the maximum envelope excursion of an unmodulated sine wave whose rms value in volts/m is defined in point 6.4.2 of Annex I (see Appendix 3 of this Annex). The test signal shall be a radio frequency sine wave, amplitude modulated by a 1 kHz sine wave at a modulation depth m of 0,8 ± 0,04. (maximum envelope excursion – minimum envelope excursion)/(maximum envelope excursion + minimum envelope excursion). 1.1. The test method described in this Annex may be applied to ESAs which may be subsequently fitted to vehicles which comply with Annex VI. A quasi-peak detector shall be used for the measurement of broadband electromagnetic emissions in this Annex, or if a peak detector is used an appropriate correction factor shall be used depending on the interference pulse rate. This test is intended to measure broadband electromagnetic emissions from ESAs. The results of measurements shall be expressed in dB microvolts/m (microvolts/m), for 120 kHz band width. If the actual band width B (expressed in kHz) of the measuring apparatus differs from 120 kHz, the readings taken in microvolts/m shall be converted to 120 kHz band width through multiplication by a factor 120/B. 3.1. The test site shall comply with the requirements of CISPR publication No 16-1 (93) (see Appendix 1). 3.2. The measuring set, test hut or vehicle in which the measurement set is located shall be outside the boundary shown in Appendix 1. 3.3. Enclosed test facilities may be used if correlation can be shown between the enclosed test facility and an approved outdoor site. 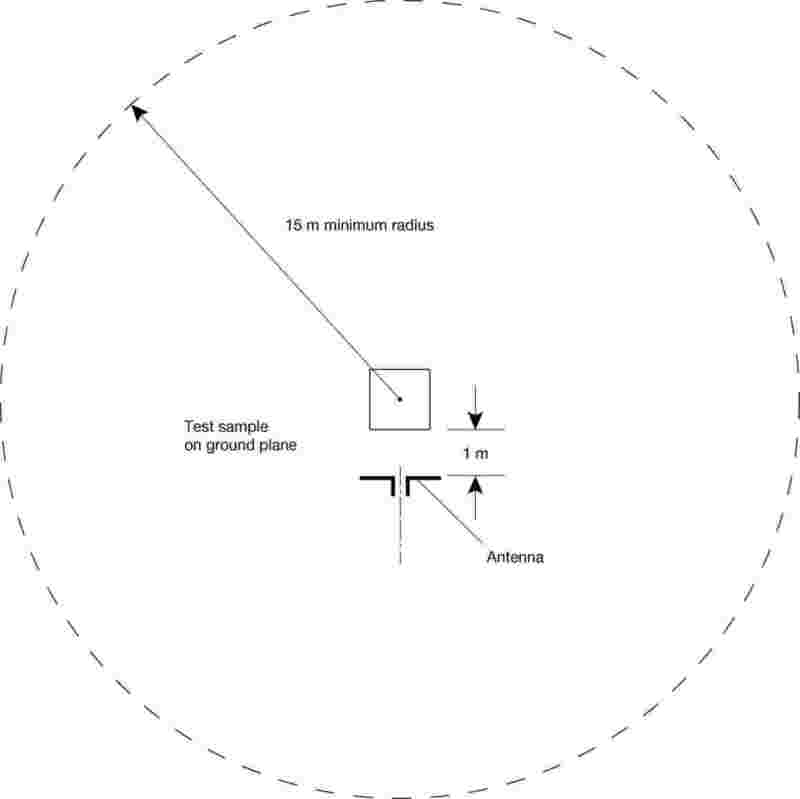 Enclosed test facilities do not need to meet the dimensional requirements of Appendix 1 other than the distance from the antenna to the ESA under test and the height of the antenna (see Figures 1 and 2 in Appendix 2). To ensure that there is no extraneous noise or signal of a magnitude sufficient to affect materially the measurement, measurements shall be taken before and after the main test. In both of these measurements, the extraneous noise or signal shall be at least 10 dB below the limits of interference given in point 6.5.2.1 of Annex I, except for intentional narrowband ambient transmissions. 4.1. The ESA under test shall be in normal operation mode. 4.2. Measurements shall not be made while rain or other precipitation is falling on the ESA under test or within 10 minutes after such rain or other precipitation has stopped. 4.3.1. The ESA under test and its wiring harnesses shall be supported 50 ± 5 mm above a wooden or equivalent non-conducting table. However, if any part of the ESA under test is intended to be electrically bonded to a vehicle's metal bodywork, that part shall be placed on a ground plane and shall be electrically bonded to the ground plane. The ground plane shall be a metallic sheet with a minimum thickness of 0,5 mm. The minimum size of the ground plane depends on the size of the ESA under test but shall allow for the distribution of the ESA's wiring harness and components. The ground plane shall be connected to the protective conductor of the earthing system. The ground plane shall be situated at a height of 1,0 ± 0,1 m above the test facility floor and shall be parallel to it. 4.3.2. The ESA under test shall be arranged and connected according to its requirements. The power supply harness shall be positioned along, and within 100 mm of, the edge of the ground plane/table closest to the antenna. 4.3.3. The ESA under test shall be connected to the grounding system according to the manufacturer's installation specification, no additional grounding connections shall be permitted. 4.3.4. The minimum distance between the ESA under test and all other conductive structures, such as walls of a shielded area (with the exception of the ground plane/table underneath the test object) must be 1,0 m.
4.4. Power shall be applied to the ESA under test via a 5 µH/50 Ω artificial network (AN) which shall be electrically bonded to the ground plane. The electrical supply voltage shall be maintained to ±10 % of its nominal system operating voltage. Any ripple voltage shall be less than 1,5 % of the nominal system operating voltage measured at the AN monitoring port. 4.5. If the ESA under test consists of more than one unit, the interconnecting cables shall ideally be the wiring harness as intended for use in the vehicle. If these are not available, the length between the electronic control unit and the AN shall be 1 500 ± 75 mm. All cables in the loom shall be terminated as realistically as possible and preferably with real loads and actuators. If extraneous equipment is required for the correct operation of the ESA under test, compensation shall be made for the contribution it makes to the emissions measured. Any linearly polarised antenna may be used provided it can be normalised to the reference antenna. The phase centre of the antenna shall be 150 ± 10 mm above ground plane. The horizontal distance from the phase centre, or tip of the antenna as appropriate, to the edge of the ground plane shall be 1,00 ± 0,05 m. No part of the antenna shall be closer than 0,5 m to the ground plane. The antenna shall be placed parallel to a plane which is perpendicular to the ground plane and coincident with the edge of the ground plane along which the principal portion of the harness runs. 5.2.3. 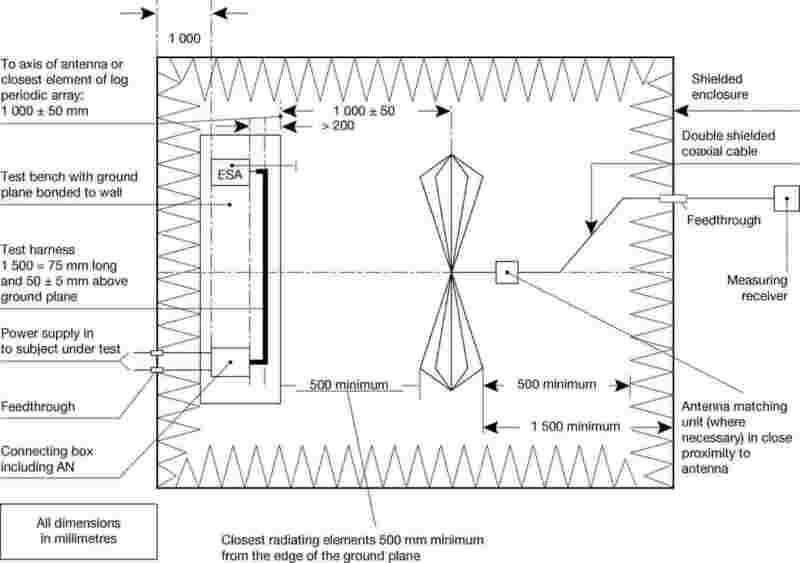 If the test is carried out in a facility enclosed for radio frequency electromagnetic screening purposes, the antenna's receiving elements shall be no closer than 0,5 m to any radio absorbent material and no closer than 1,5 m to the wall of the enclosed facility. There must be no absorbent material between the receiving antenna and the ESA under test. At the measuring point, readings shall be taken both with the antenna in a vertical and in a horizontal polarisation. The maximum of the two readings taken (in accordance with point 5.3) at each spot frequency shall be taken as the characteristic reading at the frequency at which the measurements were made. In the event that the limit is exceeded during the test, investigations shall be made to ensure that this is due to the ESA and not to background radiation. 1.1. The test method described in this Annex may be applied to ESAs. 1.3.1. This test is intended to measure the narrowband electromagnetic radiation such as might emanate from a microprocessor-based system. 1.3.2. As a short (2 to 3 minutes) initial step, choosing one antenna polarisation, it is permitted to make sweeps of the frequency range identified in point 6.1 using a spectrum analyser to indicate the existence and/or whereabouts of peak emissions. This may assist in the choice of frequencies to be tested (see point 6). 3.1. The test site shall comply with the requirements of CISPR publication No 16-1 (93) (see Appendix 1 of Annex IX). 3.2. The measuring set, test hut or vehicle in which the measurement set is located shall be outside the boundary shown in Appendix 1 of Annex IX. 3.3. Enclosed test facilities may be used if correlation can be shown between the enclosed test facility and an outdoor site. 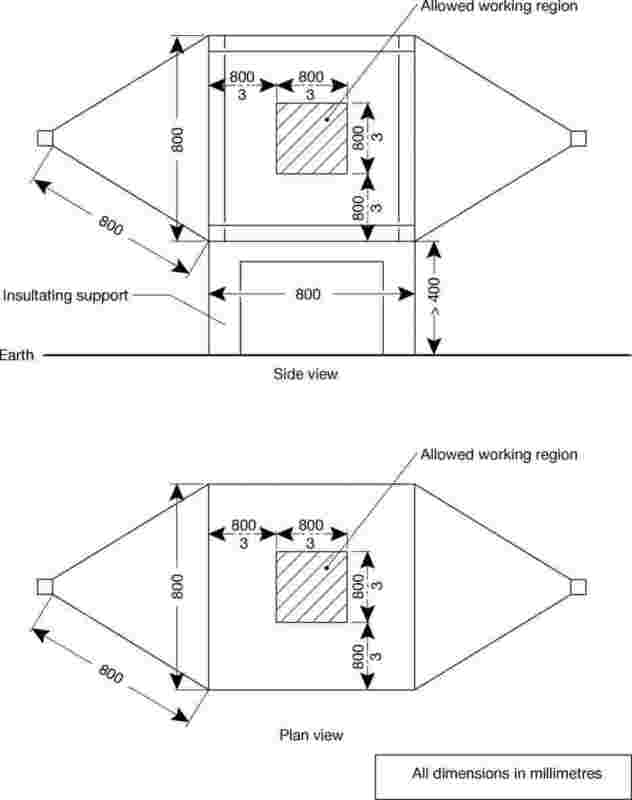 Enclosed test facilities do not need to meet the dimensional requirements of Appendix 1 of Annex IX other than the distance from the antenna to the ESA under test and the height of the antenna (see Figures 1 and 2 in Appendix 2 of Annex IX). To ensure that there is no extraneous noise or signal of a magnitude sufficient to affect materially the measurement, measurements shall be taken before and after the main test. In both of these measurements, the extraneous noise or signal shall be at least 10 dB below the limits of interference given in point 6.6.2.1 of Annex I, except for intentional narrowband ambient transmissions. 4.2. Measurements shall not be made while rain or other precipitation is falling on the ESA under test or within 10 minutes after rain or other precipitation has stopped. 4.3.1. The ESA under test and its wiring harnesses shall be supported 50 ± 5 mm above a wooden or equivalent non-conducting table. However, if any part of the ESA under test is intended to be electrically bonded to a vehicle's metal bodywork, that part shall be placed on a ground plane and shall be electrically bonded to the ground plane. The ground plane shall be a metallic sheet with a minimum thickness of 0,5 mm. The minimum size of the ground plane depends on the size of the ESA under test but shall allow for the distribution of the ESA's wiring harness and components. The ground plane shall be connected to the protective conductor of the earthing system. The ground plane shall be situated at a height of 1,0 ± 0,1 m above the test facility floor and shall be parallel to it. 4.4. Power shall be applied to the ESA under test via a 5 µH/50 Ω resistance artificial network (AN) which shall be electrically bonded to the ground plane. The electrical supply voltage shall be maintained to ±10 % of its nominal system operating voltage. Any ripple voltage shall be less than 1,5 % of the nominal system operating voltage measured at the AN monitoring port. 4.5. If the ESA under test consists of more than one unit, the interconnecting cables shall ideally be the wiring harness as intended for use in the vehicle. If these are not available, the length between the electronic control unit and the AN shall be 1 500 ± 75 mm. All cables in the loom shall be terminated as realistically as possible and preferably with real loads and actuators. If extraneous equipment is required for the correct operation of the ESA under test, compensation shall be made for the contribution it makes to the emissions measured. In the event that the limit is exceeded during the test, investigations shall be made to ensure that this is due to the ESA under test and not to background radiation. 6.2. 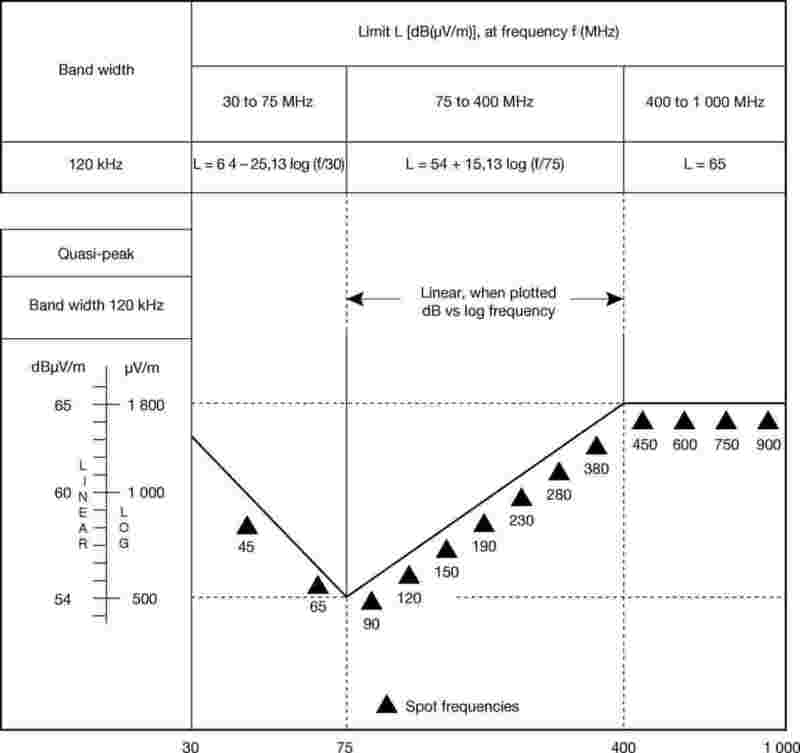 If during the initial step which may have been carried out as described in point 1.3, the radiated narrowband emissions for any of the bands identified in point 6.1 are at least 10 dB below the reference limit, then the ESA shall be deemed to comply with the requirements of this Annex in respect of that frequency band. 1.1. The test method(s) described in this Annex may be applied to ESAs. 1.2.1. ESAs may comply with the requirements of any combination of the following test methods at the manufacturer's discretion provided that this results in the full frequency range specified in point 5.1 being covered. 1.2.2. Due to radiation of electromagnetic fields during these tests, all testing shall be conducted in a shielded area (the TEM cell is a shielded area). For the tests described in this Annex, field strengths shall be expressed in volts/m and injected current shall be expressed in milliamps. 3.1. The test facility shall be capable of generating the required test signal over the frequency ranges defined in this Annex. The test facility shall comply with (national) legal requirements regarding the emission of electromagnetic signals. 3.2. The measuring equipment shall be located outside the chamber. 4.1. The ESA under test shall be in normal operation mode. It shall be arranged as defined in this Annex unless individual test methods dictate otherwise. 4.2. Power shall be applied to the ESA under test via an (5 µ H/50 Ω) artificial network (AN), which shall be electrically grounded. The electrical supply voltage shall be maintained to ±10 % of its nominal system operating voltage. Any ripple voltage shall be less than 1,5 % of the nominal system operating voltage measured at the AN monitoring port. 4.3. Any extraneous equipment required to operate the ESA under test shall be in place during the calibration phase. No extraneous equipment shall be closer than 1 m from the reference point during calibration. 4.4. To ensure reproducible measurement results are obtained when tests and measurements are repeated, the test signal generating equipment and its layout shall be to the same specification as that used during each appropriate calibration phase (points 7.2, 7.3.2.3, 8.4, 9.2 and 10.2). 4.5. If the ESA under test consists of more than one unit, the interconnecting cables shall ideally be the wiring harness as intended for use in the vehicle. If these are not available, the length between the electronic control unit and the AN shall be 1 500 ± 75 mm. All cables in the loom shall be terminated as realistically as possible and preferably with real loads and actuators. 5.1. Measurements shall be made in the 20 to 1 000 MHz frequency range. 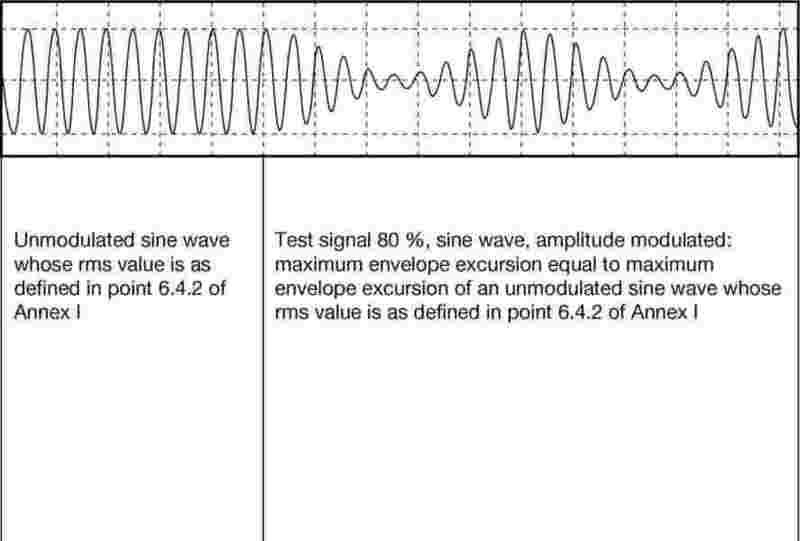 The maximum envelope excursion of the test signal shall equal the maximum envelope excursion of an unmodulated sine wave whose rms value is defined in point 6.4.2 of Annex I (see Appendix 3 of Annex VIII). This test method consists of subjecting the wiring harness connecting the components in an ESA to specified field strengths. At each desired test frequency a level of power shall be fed into the stripline to produce the required field strength in the test area with the ESA under test absent, this level of forward power, or another parameter directly related to the forward power required to define the field, shall be measured and the results recorded. These results shall be used for type-approval tests unless changes occur in the facilities or equipment which necessitate this procedure being repeated. During this process, the position of the field probe head shall be under the active conductor, centred in longitudinal, vertical and transversal directions. The housing of the probe's electronics shall be as far away from the longitudinal stripline axis as possible. The test method allows the generation of homogeneous fields between an active conductor (the stripline 50 Ω impedance), and a ground plane (the conducting surface of the mounting table), between which part of the wiring harness may be inserted. The electronic controller(s) of the ESA under test shall be installed on the ground plane but outside the stripline with one of its edges parallel to the active conductor of the stripline. It shall be 200 ± 10 mm from a line on the ground plane directly under the edge of the active conductor. The distance between any edge of the active conductor and any peripheral device used for measurement shall be at least 200 mm. The wiring harness section of the ESA under test shall be placed in a horizontal attitude between the active conductor and the ground plane (see Figures 1 and 2 in Appendix 1). 7.3.1.1. The minimum length of the wiring harness, which shall include the power harness to the electronic control unit and shall be placed under the stripline, shall be 1,5 m unless the wiring harness in the vehicle is less than 1,5 m. In this case, the length of the wiring harness shall be that of the longest length of harness used in the vehicle installation. Any line branches occurring in this length shall be routed perpendicularly to the longitudinal axis of the line. 7.3.1.2. Alternatively, the fully extended length of the wiring harness, including the length of the longest of any branches, shall be 1,5 m.
The stripline consists of two parallel metallic plates separated by 800 mm. Equipment under test is positioned centrally between the plates and subjected to an electromagnetic field (see Figures 3 and 4 in Appendix 1). This method can test complete electronic systems including sensors and actuators as well as the controller and wiring loom. It is suitable for apparatus whose largest dimension is less than one-third of the plate separation. The stripline shall be housed in a screened room (to prevent external emissions) and positioned 2 m away from walls and any metallic enclosure to prevent electromagnetic reflections. RF absorber material may be used to damp these reflections. The stripline shall be placed on non-conducting supports at least 0,4 m above the floor. A field measuring probe shall be positioned within the central one-third of the longitudinal, vertical and transverse dimensions of the space between the parallel plates with the system under test absent. The associated measuring equipment shall be sited outside the screen room. At each desired test frequency, a level of power shall be fed into the stripline to produce the required field strength at the antenna. This level of forward power, or another parameter directly related to the forward power required to define the field, shall be used for type-approval tests unless changes occur in the facilities or equipment which necessitate this procedure being repeated. The main control unit shall be positioned within the central one-third of the longitudinal, vertical and transverse dimensions of the space between the parallel plates. It shall be supported on a stand made from non-conducting material. The main wiring loom and any sensor/actuator cables shall rise vertically from the control unit to the top ground plate (this helps to maximise coupling with the electromagnetic field). Then they shall follow the underside of the plate to one of its free edges where they shall loop over and follow the top of the ground plate as far as the connections to the stripline feed. The cables shall then be routed to the associated equipment which shall be sited in an area outside the influence of the electromagnetic field, for example: on the floor of the screened room 1 m longitudinally away from the stripline. This test method allows the testing of vehicle electrical/electronic systems by exposing an ESA to electromagnetic radiation generated by an antenna. The test shall be performed inside a semi-anechoic chamber on a bench top. 8.2.1.1. For free field immunity testing, the ESA under test and its wiring harnesses shall be supported 50 ± 5 mm above a wooden or equivalent non-conducting table. However, if any part of the ESA under test is intended to be electrically bonded to a vehicle's metal bodywork, that part shall be placed on a ground plane and shall be electrically bonded to the ground plane. The ground plane shall be a metallic sheet with a minimum thickness of 0,5 mm. The minimum size of the ground plane depends on the size of the ESA under test but shall allow for the distribution of the ESA's wiring harness and components. The ground plane shall be connected to the protective conductor of the earthing system. The ground plane shall be situated at a height of 1,0 ± 0,1 m above the test facility floor and shall be parallel to it. 8.2.1.2. The ESA under test shall be arranged and connected according to its requirements. The power supply harness shall be positioned along, and within 100 mm of, the edge of the ground plane/table closest to the antenna. 8.2.1.3. The ESA under test shall be connected to the grounding system according to the manufacturer's installation specification, no additional grounding connections shall be permitted. 8.2.1.4. The minimum distance between the ESA under test and all other conductive structures, such as walls of a shielded area (with the exception of the ground plane/table underneath the test object) must be 1,0 m.
8.2.1.5. The dimension of any ground plane shall be 2,25 square metres or larger in area with the smaller side no less than 750 mm. The ground plane shall be bonded to the chamber with bonding straps such that the DC bonding resistance shall not exceed 2,5 milliohms. For large equipment mounted on a metal test stand, the test stand shall be considered a part of the ground plane for testing purposes and shall be bonded accordingly. The faces of the test sample shall be located at a minimum of 200 mm from the edge of the ground plane. All leads and cables shall be a minimum of 100 mm from the edge of the ground plane and the distance to the ground plane (from the lowest point of the harness) shall be 50 ± 5 mm above the ground plane. Power shall be applied to the ESA under test via an (5 µ H/50 Ω) artificial network (AN). 8.3.1.1. The field generating device type(s) shall be chosen such that the desired field strength is achieved at the reference point (see point 8.3.4) at the appropriate frequencies. 8.3.1.2. The field generating device(s) may be (an) antenna(s) or a plate antenna. 8.3.1.3. The construction and orientation of any field generating device shall be such that the generated field is polarised: from 20 to 1 000 MHz horizontally or vertically. The phase centre of any antenna shall be 150 ± 10 mm above the ground plane on which the ESA under test rests. No parts of any antenna's radiating elements shall be closer than 250 mm to the floor of the facility. 8.3.2.2.1. In-service conditions may best be approximated by placing the field generating device as far from the ESA as practical. This distance will typically lie within the range 1 to 5 m.
8.3.2.2.2. If the test is carried out in an enclosed facility, the field generating device's radiating elements shall be no closer than 0,5 m to any radio absorbent material and no closer than 1,5 m to the wall of the facility. There shall be no absorbent material interposed between the transmitting antenna and the ESA under test. 8.3.3.1. The field generating device's radiating elements shall not be closer than 0,5 m to the edge of the ground plane. 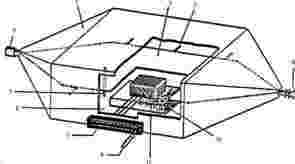 is perpendicular to the edge of the ground plane and the principal portion of the wiring harness. The field generating device shall be placed parallel to this plane (see Figures 1 and 2 in Appendix 4). 8.3.3.3. Any field generating device which is placed over the ground plane or ESA under test shall extend over the ESA under test. 8.3.4.3. 150 ± 10 mm above the ground plane. 8.4.1. The ‘substitution method’ shall be used to establish the test field conditions. At each desired test frequency, a level of power shall be fed into the field generating device to produce the required field strength at the reference point (as defined in point 8.3.4 in the test area with the ESA under test absent), this level of forward power, or another parameter directly related to the forward power required to define the field, shall be measured and the results recorded. These results shall be used for type-approval tests unless changes occur in the facilities or equipment which necessitates this procedure being repeated. 8.4.3. Extraneous equipment must be a minimum of 1 m from the reference point during calibration. 8.4.5. The phase centre of the field strength measuring device shall be positioned at the reference point. 8.4.6. The ESA under test which may include an additional ground plane shall then be introduced into the test facility and positioned in accordance with the requirements of point 8.3. If a second ground plane is used, then it shall be within 5 mm of the bench ground plane and electrically bounded to it. The required forward power defined in point 8.4.2 at each frequency as defined in point 5 shall then be applied to the field generating device. 8.4.7. Whatever parameter was chosen in point 8.4.2 to define the field, the same parameter shall be used to determine the field strength during the test. 8.5.1. During the calibration phase of the substitution method (prior to an ESA under test being introduced into the test area), the field strength shall not be less than 50 % of the nominal field strength 0,5 ± 0,05 m either side of the reference point on a line parallel to the edge of the ground plane nearest to the antenna and passing through the reference point. The transverse electromagnetic mode (TEM) cell generates homogeneous fields between the internal conductor (septum) and housing (ground plane). 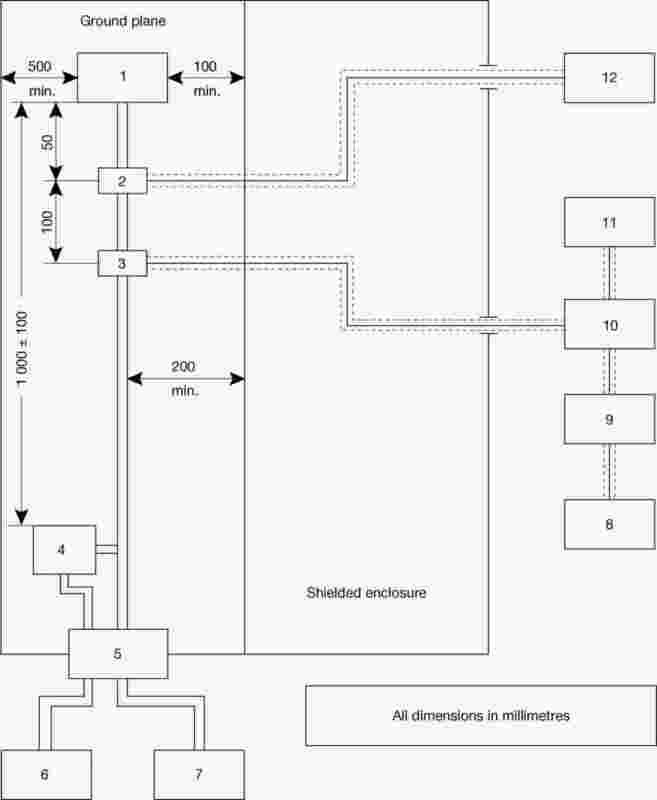 It is used for testing ESAs (see Figure 1 in Appendix 3). Separation distance (metres) between the upper wall and the plate (septum). 9.2.2. Alternatively an appropriate field strength sensor shall be placed in the upper half of the TEM cell. In this part of the TEM cell the electronic control unit(s) has only a small influence on the test field. The output of this sensor shall determine the field strength. In order to maintain a homogeneous field in the TEM cell and to obtain repeatable measurement results, the test object shall not be larger than one-third of the cell inside height. 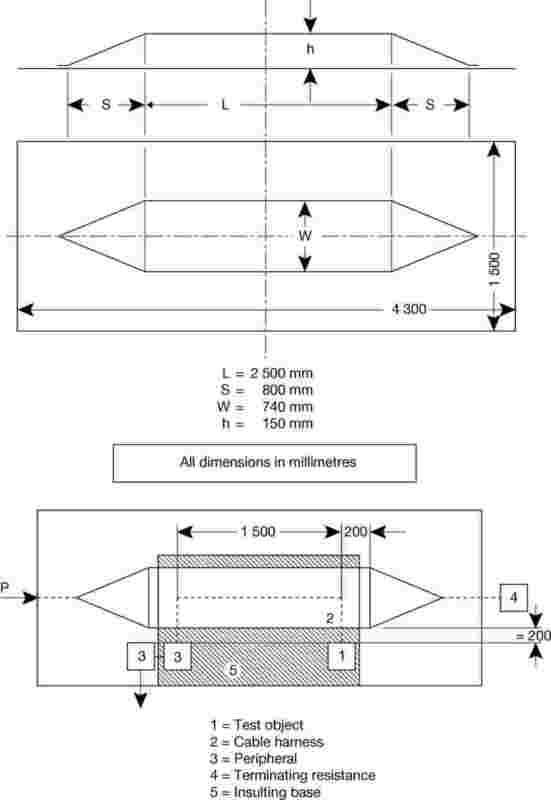 Recommended TEM cell dimensions are given in Appendix 3, Figures 2 and 3. The TEM cell shall be attached to a co-axial socket panel and connected as closely as possible to a plug connector with an adequate number of pins. The supply and signal leads from the plug connector in the cell wall shall be directly connected to the test object. directly to the screened patchboard. Screened cables must be used in connecting the TEM cell to the peripheral or the vehicle if the vehicle or peripheral is not in the same or adjacent screened room. This is a method of carrying out immunity tests by inducing currents directly into a wiring harness using a current injection probe. The injection probe consists of a coupling clamp through which the cables of the ESA under test are passed. Immunity tests can then be carried out by varying the frequency of the induced signals. The ESA under test may be installed on a ground plane as in point 8.2.1 or in a vehicle in accordance with the vehicle design specification. The injection probe shall be mounted in a calibration jig. Whilst sweeping the test frequency range, the power required to achieve the current specified in point 6.7.2.1 of Annex I shall be monitored. 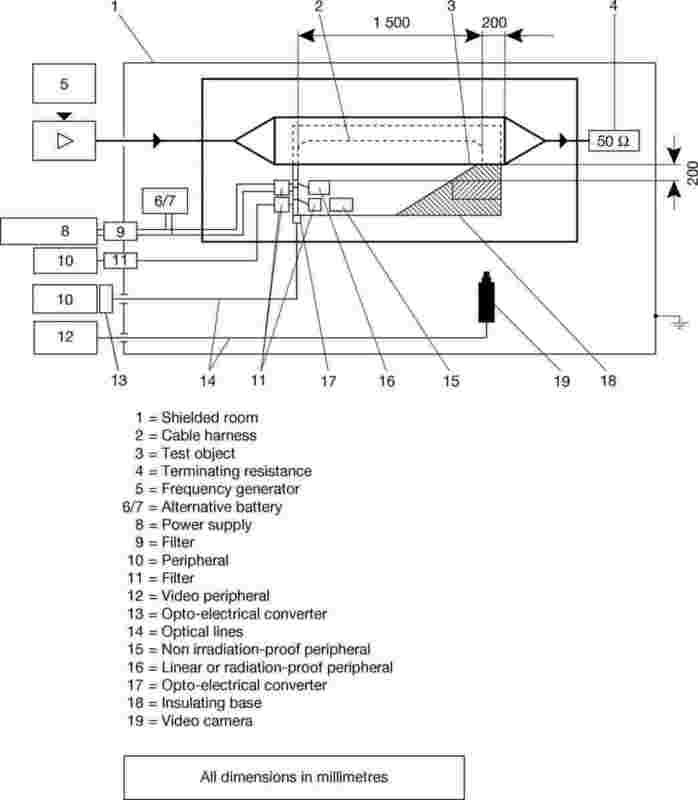 This method calibrates the bulk current injection system forward power versus current prior to testing, and it is this forward power which shall be applied to the injection probe when connected to the ESA under test via the cables used during calibration. It should be noted that the monitored power applied to the injection probe is the forward power. For an ESA mounted on a ground plane as in point 8.2.1 all cables in the wiring harness shall be terminated as realistically as possible and preferably with real loads and actuators. For both vehicle mounted and ground plane mounted ESAs the current injection probe shall be mounted in turn around all the wires in the wiring harness to each connector and 150 ± 10mm from each connector of the ESA under test electronic control units (ECU), instrument modules or active sensors as illustrated in Appendix 2. For an ESA under test mounted on a ground plane as in point 8.2.1, a wiring harness shall be connected between an artificial network (AN) and the principal electronic control unit (ECU). This harness shall run parallel to the edge of the ground plane and 200 mm minimum from its edge. This harness shall contain the power feed wire which is used to connect the vehicle battery to this ECU and the power return wire if used on the vehicle. The distance from the ECU to the AN shall be 1,0 ± 0,1 m or shall be the harness length between the ECU and the battery as used on the vehicle, if known, whichever is the shorter. If a vehicle harness is used then any line branches which occur in this length shall be routed along the ground plane but perpendicular away from the edge of the ground plane. Otherwise the ESA under test wires which are in this length shall break out at the AN. only as regards the reference to Directive 75/322/EEC in Article 1 and Annex, point A.12. if the vehicles, components or separate technical units comply with the requirements of Directive 75/322/EEC, as amended by this Directive. for any type of vehicle component or separate technical unit, if the requirements of Directive 75/322/EEC, as amended by this Directive, are not fulfilled. 3. Paragraph 2 shall not apply to vehicle types approved before 1 October 2002 pursuant to Council Directive 77/537/EEC () nor to any subsequent extensions to these approvals. 5. Without prejudice to paragraphs 2 and 4, in the case of replacement parts, Member States shall continue to grant EC type-approval and to permit the sale and entry into service of components or separate technical units intended for use on vehicle types which have been approved before 1 October 2002 pursuant to Directive 75/322/EEC or Directive 77/537/EEC and, where applicable, subsequent extensions to these approvals. (2) OJ L 220, 29.8.1977, p. 38.’.